I loved pizza. 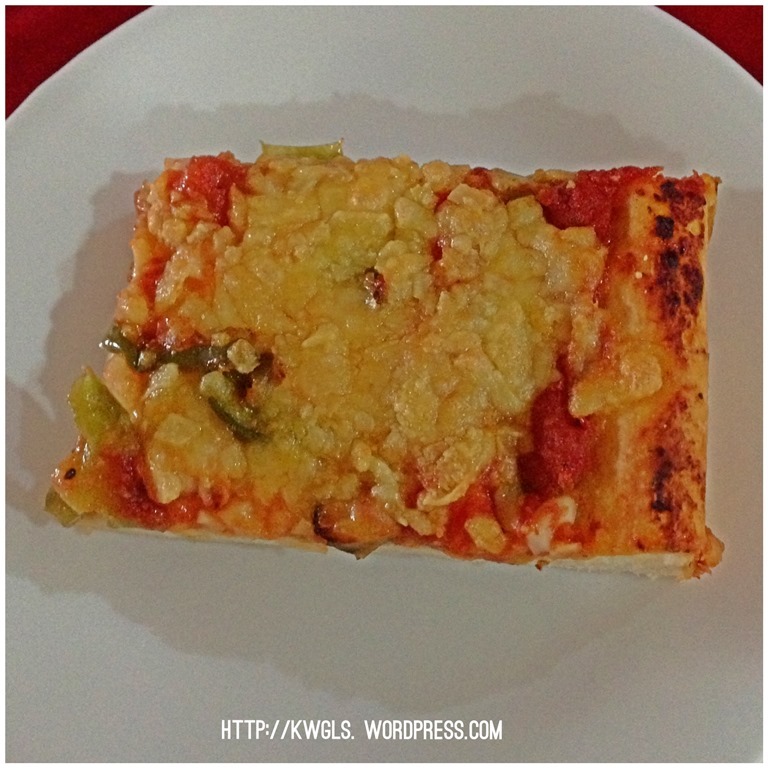 Pizza is one of the most common food that I ordered when I have meals in Western Restaurants. I love pizza for its dough and cheese. It is a comfort food that I can easily eat an 6 inches diameter pizza. However. 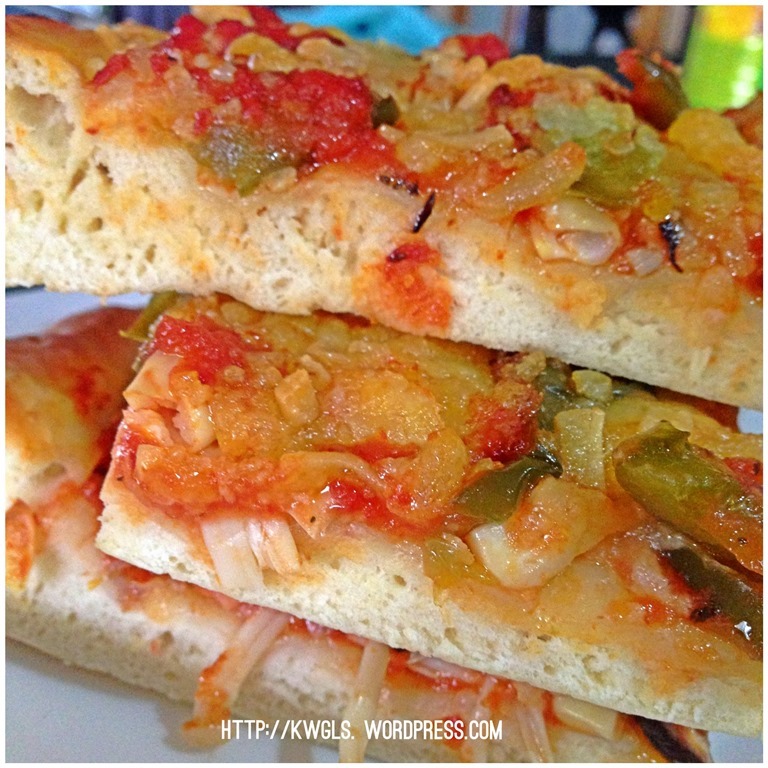 I have never really ever prepare pizza since I start my baking 15 years ago. 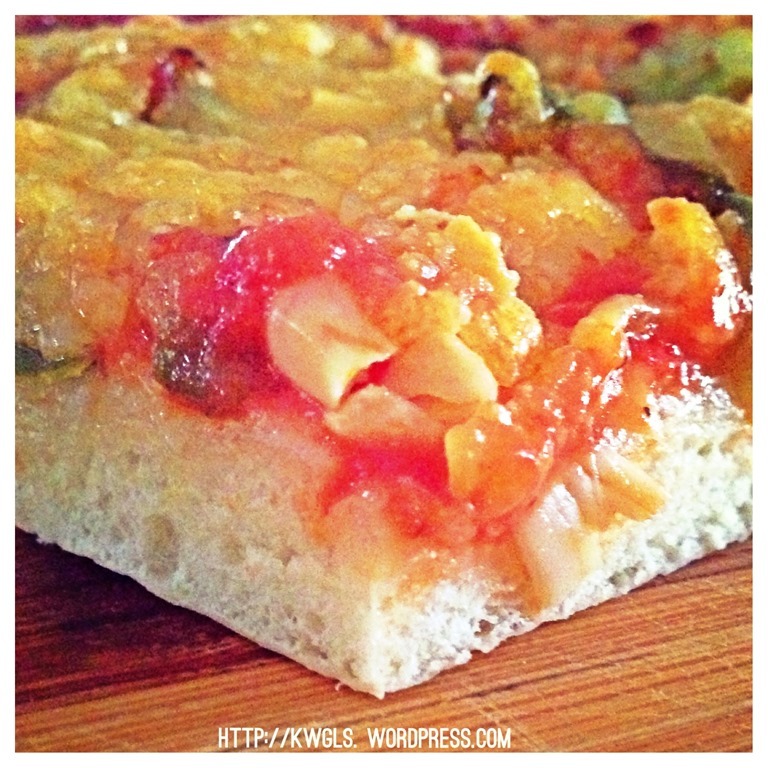 I am thinking that since I have made bread, cakes, muffins cupcakes etc., why don’t I make my own pizza? 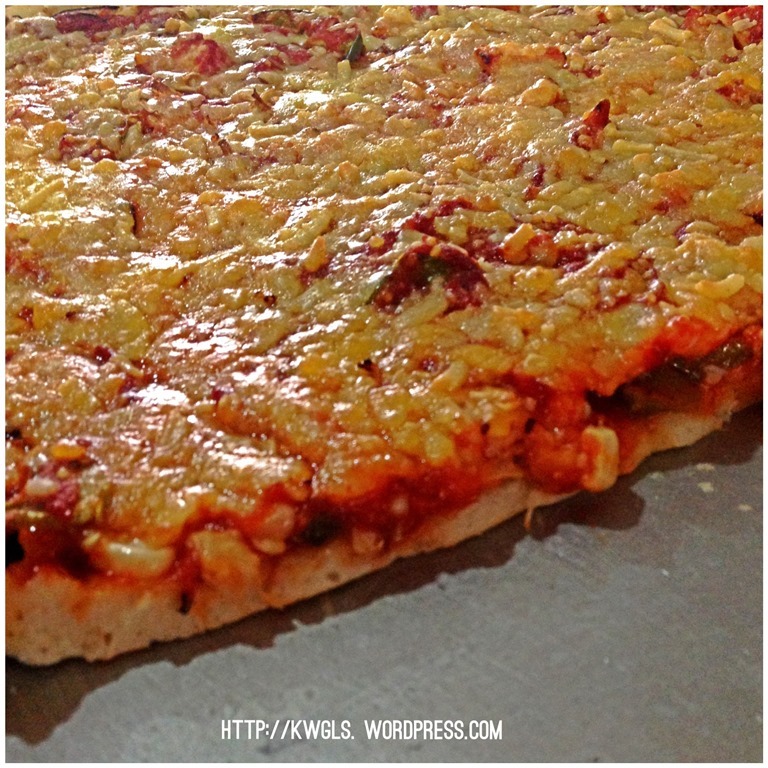 In my Facebook group : Food Bloggers and Foodies United, one of the bloggers Ms Ainy Wajahat from Pakistan have posted some pizza recipes and I promised here that I will bake some pizza. Therefore, I have based on her recipes to make the dough. 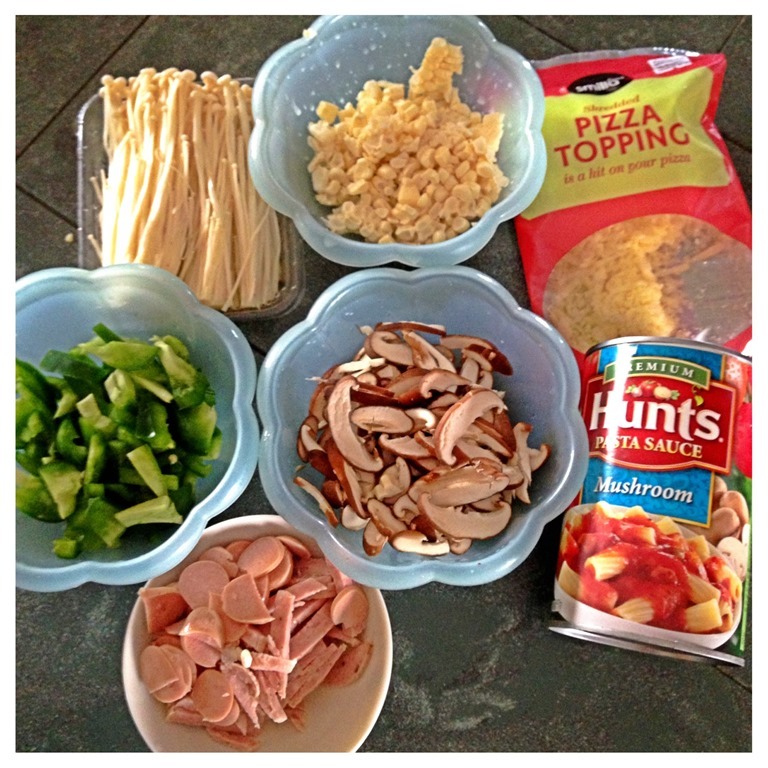 For the toppings, since I am still on the vegetarian diet, I have used mostly vegetables found in my fridge. Initially, I intended to make my own pasta sauce. Somehow, as I am too tired that afternoon, I rushed to a provision store nearby and bought a can of ready made pasta sauce. You can read the making of Pasta Sauce from fresh tomatoes HERE. 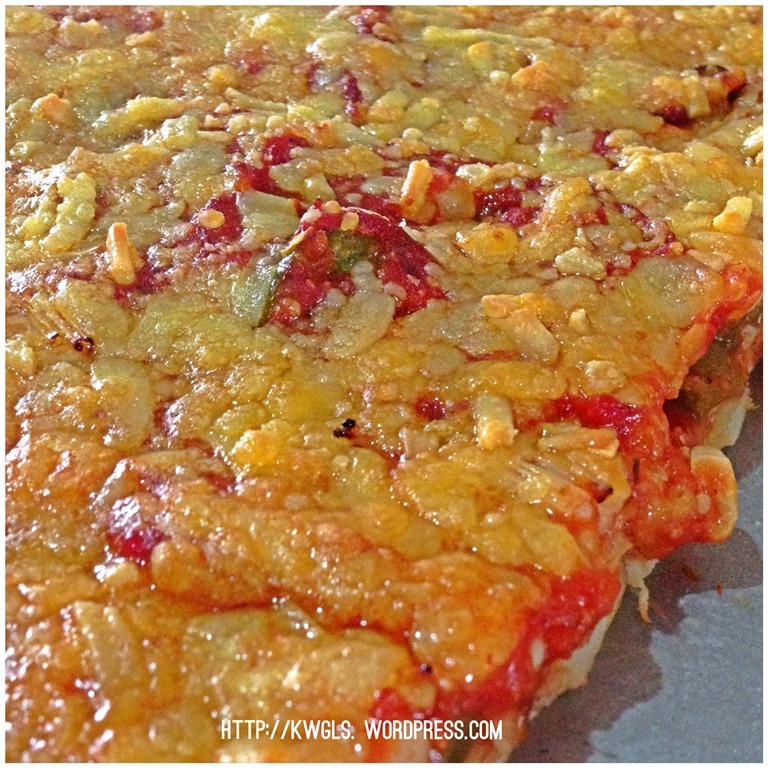 Instead of preparing it in the traditional round shape pizza, I have opted to make a rectangular shape pizza which is easier for me to bake and cut for later serving. 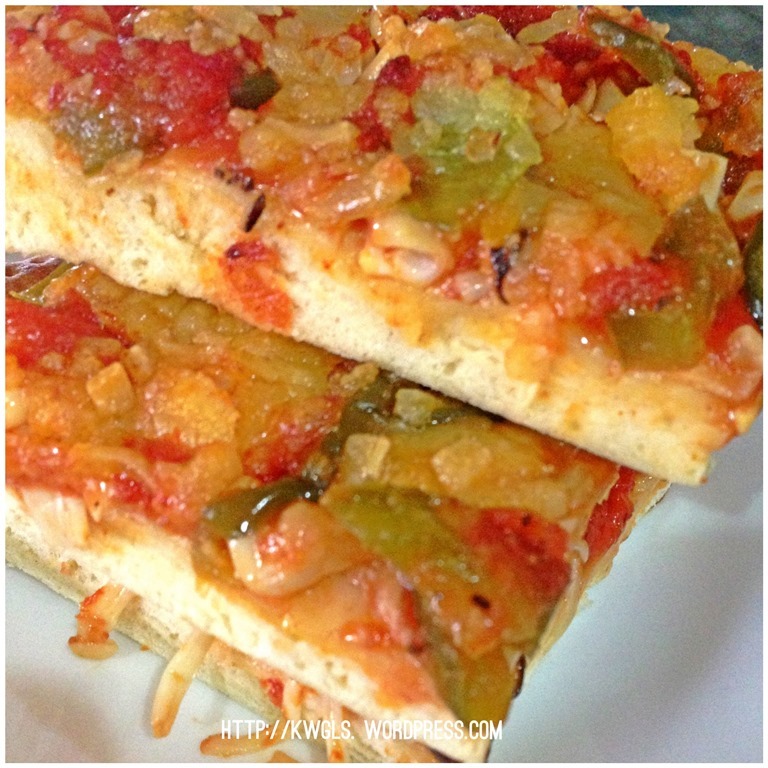 I made the dough in the morning and intended to have the pizza for lunch, somehow, the family members decided to go out for lunch, therefore, I froze my dough in the fridge and only made the pizza during dinner time. Making pizza is really simple and at times, I just wonder why shall I pay so much for pizzas that were sold in the eating outlets. Abundant of mozzarella cheeses or cheddar cheeses or goat cheese or other cheeses of your choice. The ingredients here are for reference only. You can add a whole range of your preferred vegetable such as tomatoes, pineapples, preserved olives, celeries and etc.. In a big mixing bowl, place all materials except butter/ghee/cooking oil/olive oil and use a dough hook to mix until well mix. Add in butter and continue to beat until the dough is smooth. Let it proof for at least 1 hour or until the dough size double. Use a cling wrap or a wet towel to cover the top. Lightly grease a baking tin and pre-heat your oven to 200 degree Celsius. 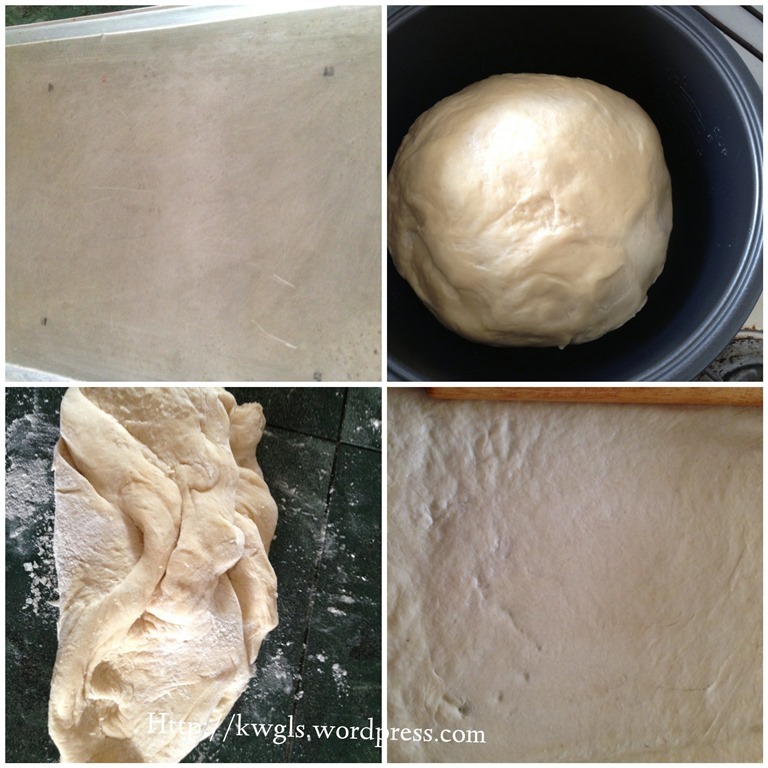 Punch your dough in the centre to let the air escape. 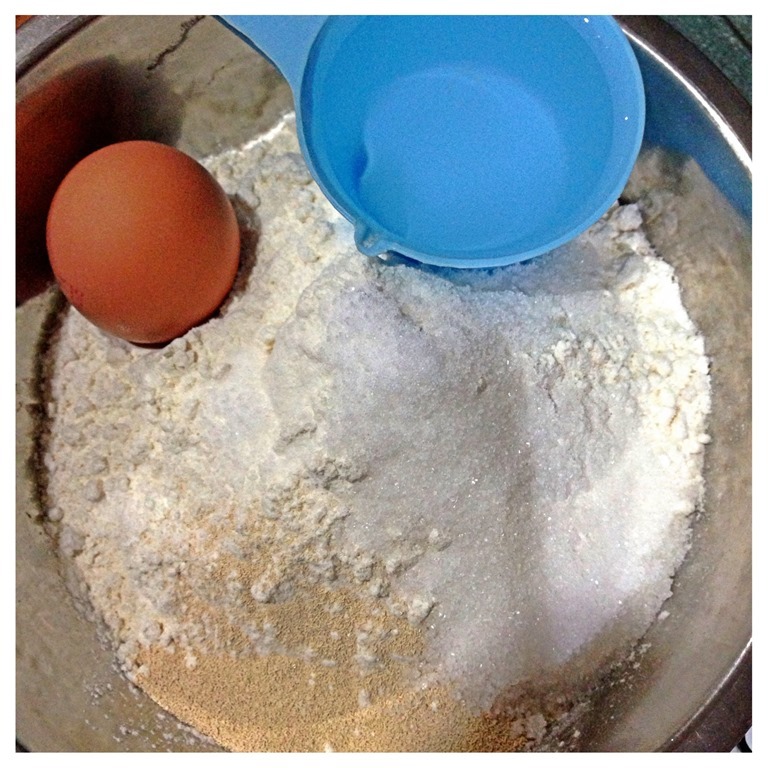 Lightly knead and use a roller pin to roll into a flat piece resembling the shape of the baking tin. It will be about 0.5-1 cm thick for the dough to cover all the tin area. Make it as even as possible. 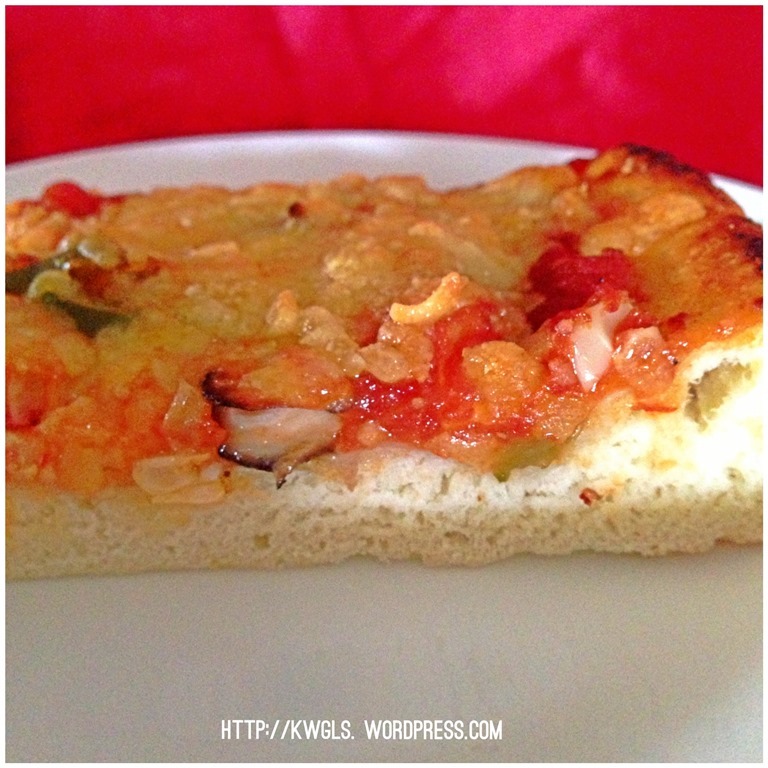 Use a fork to lightly make some holes on top of the dough. As this is a big piece of pizza, this is to let the air to have some holes to escape. Fill the top with your choice of vegetables and meats, if desired. sprinkle some Italian herbs mix such as basil, oregano etc..
Sprinkle sparingly with mozzarella cheese or other cheeses with your choice. 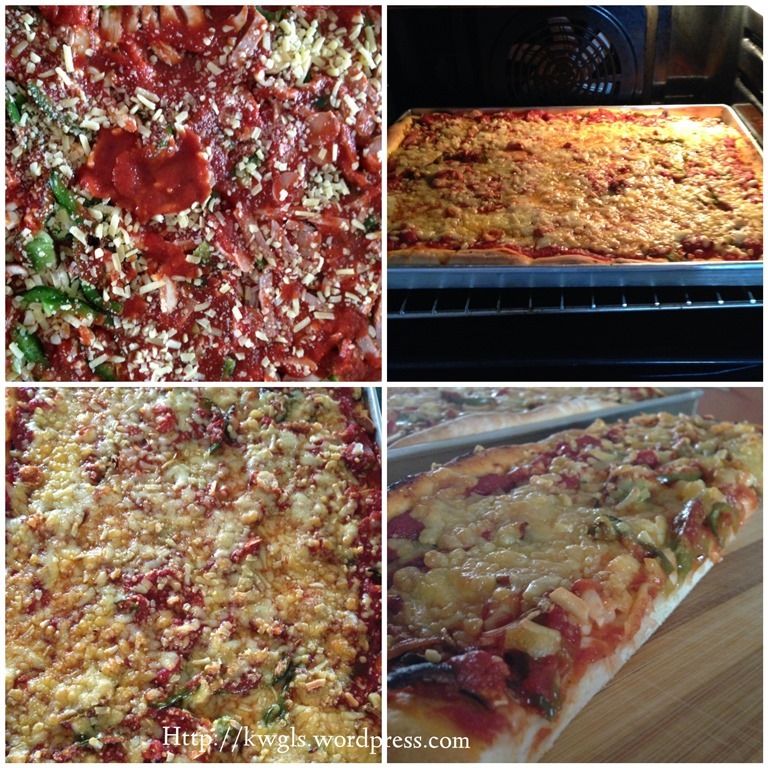 I have make half of the pizza as vegetarian and another half into ham and sausage pizzas for my kids. 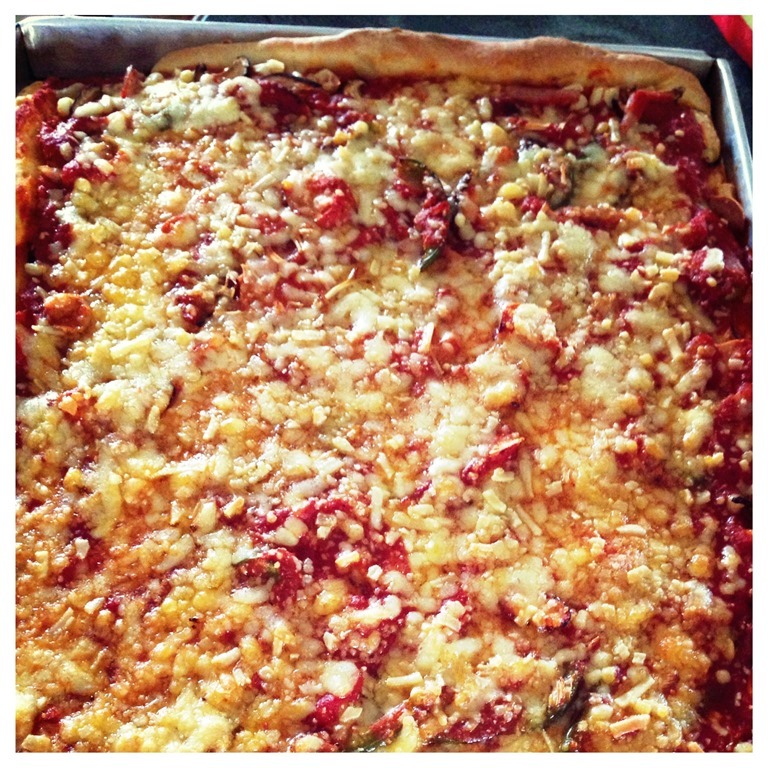 Bake your pizza in the oven for 15-20 minutes until the bases are cooked and cheeses have melt. Cur into your desired size and shape and best serve hot with your choice of additional sauces such as Tabasco sauces, mayonnaise or just plain. 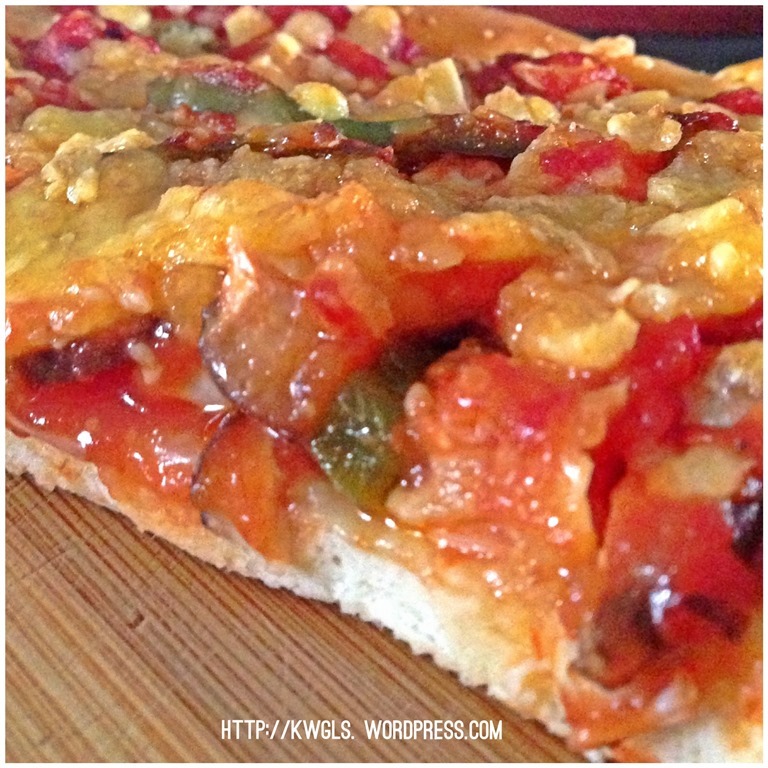 This was one of my very first basic vegetarian pizza that I have made with great success. 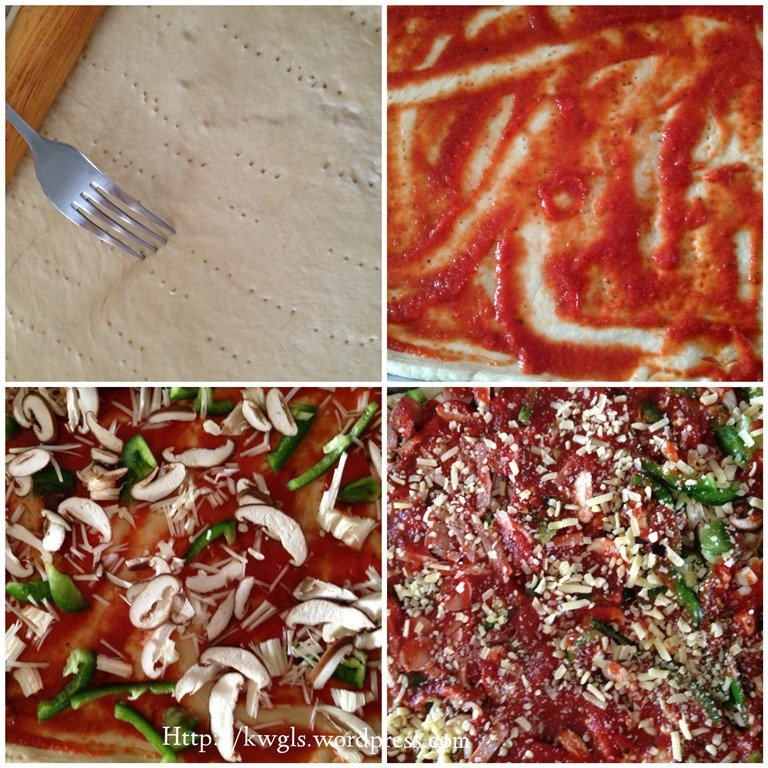 The post was very short because it deals with basic pizza preparation. More variations will come and Guaishushu will tailor the taste to the very Asian taste such as curry and etc.. However, that shall have to wait after Guaishushu finishes his vegetarian diet. 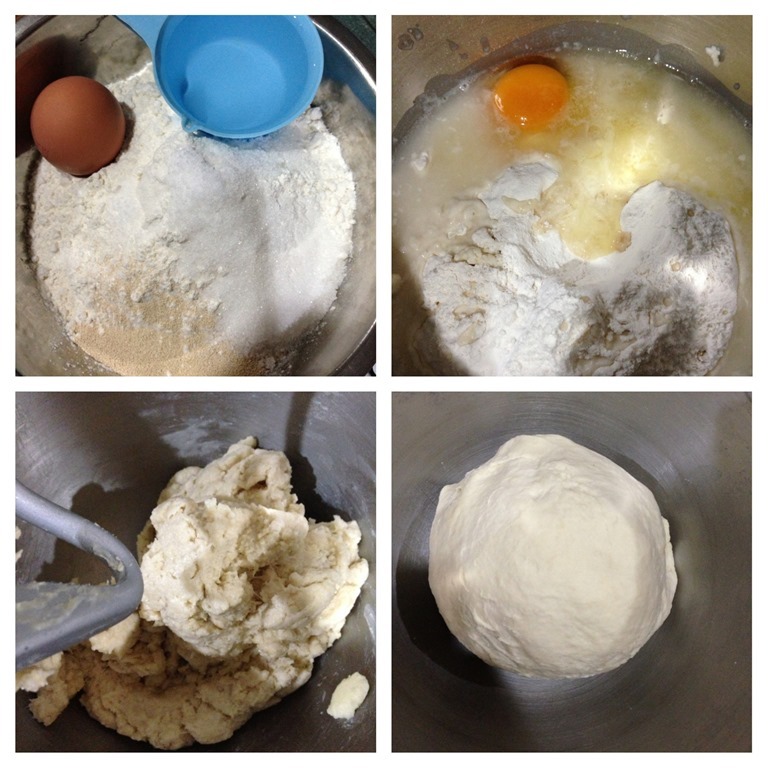 This entry was posted in Dish, Food Preparation Series and tagged 8, Abundant, Ainy, area, Asian, Bake, Basic, basil, Bloggers, bread, butter, Celsius, Cheers, Cheese, cheeses, CONCLUSION, Cooks, corns, degree, diameter, dinner, dough, Enoki, Facebook, Fill, food, Foodies, fridge, ghee, grams, Guaishushu, HERBS, HERE, Hope, hour, ingredients, Instead, INTRODUCTION, Italian, Just, Make, meats, mozzarella, mutton, outlets, oven, Pakistan, Pasta, Pinches, Pizza, pizzas, postaday, preparation, provision, Punch, recipe, Recipes, reference, restaurants, roller, room, Sauce, sauces, simple, size, Some, Spread, Sprinkle, STEPS, Tabasco, tablespoon, temperature, tomatoes, toppings, Variations, vegetables, vegetarian, Wajahat, Western, yeast. Bookmark the permalink. Hi, it looks so great. I think I will try to make it too. Thanks for the recipe. You make it look so quick and easy! I’ve tried pizza dough once before and it went horrifically wrong, luckily I had a plain base in the freezer we were able to use! I’ll definitely be having a go at this, especially seeing how fluffy your dough is. Nipping over from ‘Recipe Of The Week’.